Here are some snazzy birthday facts about 16th of December 1962 that no one tells you about. Don’t wait a minute longer and jump in using the content links below. Average read time of 10 minutes. Enjoy! What day was my birthday Dec 16, 1962? December 16, 1962 was a Sunday and it was the 350th day of the year 1962. It was the 50th Sunday of that year. The next time you can reuse your old 1962 calendar will be in 2029. Both calendars will be exactly the same! This is assuming you are not interested in the dates for Easter and other irregular holidays that are based on a lunisolar calendar. There are 238 days left before your next birthday. You will be 57 years old when that day comes. There have been 20,581 days from the day you were born up to today. If you’ve been sleeping 8 hours daily since birth, then you have slept a total of 6,860 days or 18.78 years. You spent 33% of your life sleeping. Since night and day always follow each other, there were precisely 697 full moons after you were born up to this day. How many of them did you see? The next full moon that you can see will be on May 18 at 21:13:00 GMT – Saturday. Fun stat: Your first one billion seconds (1,000,000,000) happened sometime on August 24, 1994. If a dog named Prada - a Wirehaired Pointing Griffon breed, was born on the same date as you then it will be 272 dog years old today. A dog’s first human year is equal to 15 dog years. Dogs age differently depending on breed and size. When you reach the age of 6 Prada will be 42 dog years old. From that point forward a medium-sized dog like Prada will age 4.5 dog years for every human year. English Interregnum: The Protectorate – Oliver Cromwell becomes Lord Protector of the Commonwealth of England, Scotland and Ireland. First Balkan War: The Royal Hellenic Navy defeats the Ottoman Navy at the Battle of Elli. Thailand joins the United Nations. A United Airlines Douglas DC-8 and a TWA Lockheed Super Constellation collide over Staten Island, New York and crash, killing all 128 people aboard both aircraft and 6 more on the ground. What does my birthday December 16, 1962 mean? Your birthday numbers 12, 16, and 1962 reveal that your Life Path number is 1. It represents initiative, potential and singularity. You are a born leader. You insist on your right to make up your own mind; you demand freedom of thought and action. The following celebrities also have the same life path number: Ariel, Jayam Ravi, Jeanette MacDonald, Saïd Taghmaoui, Grex, Roy Boulting, Laura Sadler, Stedman Pearson, Brock Peters, Matt Frewer. What is the birthday horoscope for Dec 16, 1962? The Western zodiac or sun sign of a person born on December 16 is Sagittarius ♐ (The Archer) – a mutable sign with Fire as Western element. The ruling planet is Jupiter – the planet of luck and expansion. According to the ancient art of Chinese astrology (or Eastern zodiac), Tiger is the mythical animal and Water is the Eastern element of a person born on December 16, 1962. Fun fact: The birth flower for 16th December 1962 is Holly for precious moments. 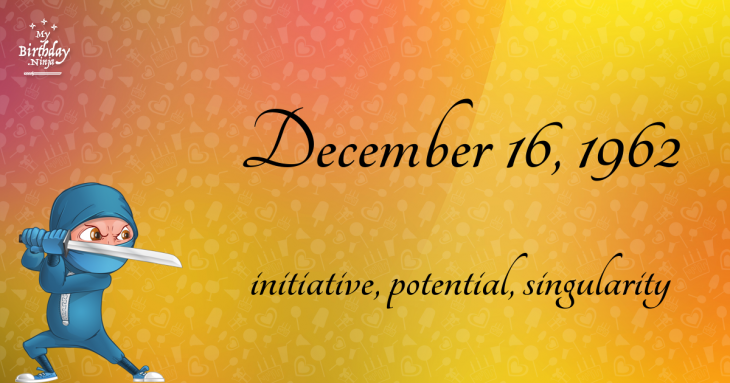 What is the Love Match for Dec 16, 1962? When it comes to love and relationship, you are most compatible with a person born on October 14, 1991. You have a Love Match compatibility score of +163. Imagine being in love with your soul mate. On the negative side, you are most incompatible with a person born on August 2, 1970. Your incompatibility score is -163. You’ll be like a cat and a dog on a love-hate relationship. Arf-arf, I want to bite you. Meow-meow, stay away from me! The number-one hit song in the U.S. at the day of your birth was Telstar by The Tornadoes as compiled by Billboard Hot 100 (December 22, 1962). Ask your parents if they know this popular song. I do not know how you feel about this, but you were a female ♀ in your last earthly incarnation. You were born somewhere around the territory of Western Africa approximately on 1050. Your profession was medicine man, surgeon, herbalist. How many babies were born on December 16, 1962? Base on the data published by the United Nations Population Division, an estimated 111,558,191 babies were born throughout the world in the year 1962. The estimated number of babies born on 16th December 1962 is 305,639. That’s equivalent to 212 babies every minute. Try to imagine if all of them are crying at the same time. What is the popular baby name on 16 Dec 1962? Here’s a quick list of all the fun birthday facts about December 16, 1962. Celebrities, famous birthdays, historical events, and past life were excluded. 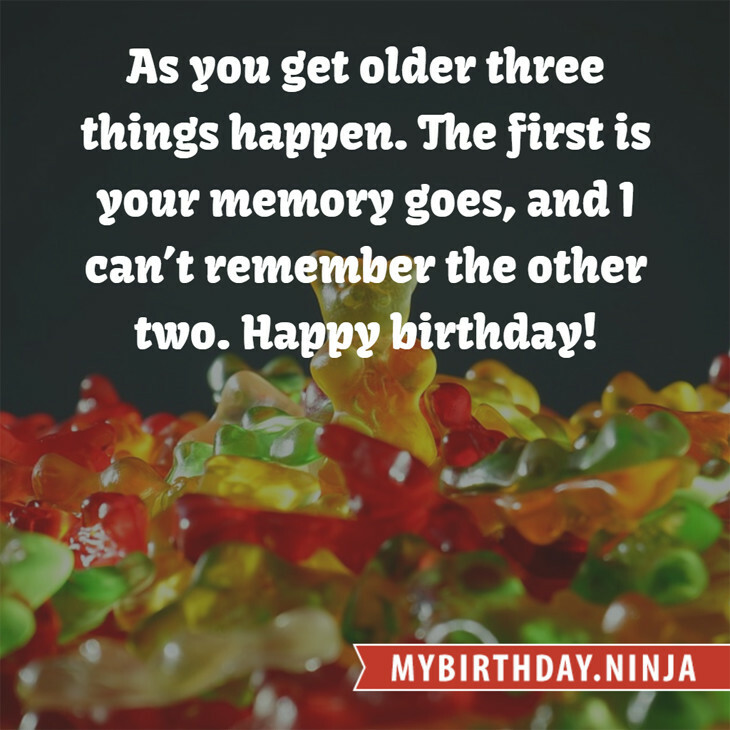 Try another birth date of someone you know or try the birthday of these celebrities: September 19, 1988 – Katrina Bowden, American actress; February 12, 1994 – Subin, South Korean singer-songwriter, actress, model, and MC (Dal Shabet); August 1, 1989 – Tomoka Kurokawa, Japanese actress.